Led by: Penny Laughton and Caroline Martin together with local guides and hosts at various venues. Join us for a trip to this dynamic city, the base for many of Germany’s leading manufacturers and home to the famous 1927 Weissenhof Estate. 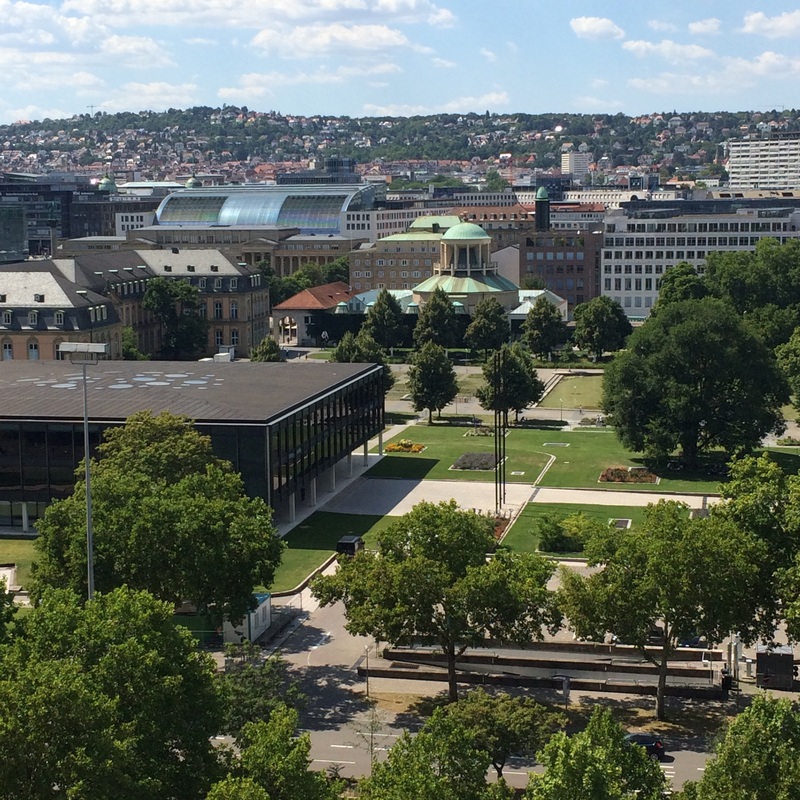 Stuttgart’s tradition of training and employing architects and engineers has led to a consistent interest in the built environment, evidenced in buildings and landscaping of significant quality. From the inter-war work of Paul Bonatz and Paul Schmitthenner to the role of the State Building Construction Office in post 1945 reconstruction, and in the more experimental edifices by Frei Otto and Atelier 5, there is much to enjoy. Latterly architects from other countries have enhanced the city, including James Stirling and Michael Wilford in the ‘80s and ‘90s, and more recently Eun Young Yi and David Chipperfield. Early morning flights will get you to the City in time for our afternoon walking tour of the City centre. Organise your own transfer to the City. We suggest taking the S-bahn (municipal railway) - lines S2 and S3 take you to the Central Railway station in 30 minutes. Meet 15.30 at Central Railway Station (full details to follow) for a 2-2.5 hours walk to see key city centre buildings, 1914 to the present day. 18.00–19.00 Welcome drink and introduction - location to be confirmed. You are free to make your own arrangements for dinner. Meet 08.45 at Central Railway Station to walk to the City Palace Museum (rebuilt 1961-65 and refurbished 2013) to tour the building and exhibits. From there to the State Parliament (the first built in Europe post-WW2; various architects) and on to the State Library (1970; Horst Linde) - we have access to both these buildings. This part of the trip will be on foot. In the afternoon we take a coach to the University of Stuttgart at Vaihingen for tours of Frei Otto’s Institute for Lightweight Structures (1969) and Swiss practice Atelier 5’s Dining Hall (1976), as well as the latter’s Student dormitories (1972) (exterior only) . We will return to the City by coach. In the evening we will meet for a group dinner (included) at a restaurant in central Stuttgart - time and location to be confirmed. Meet 08.30 at the Central Railway Station and take tram to Eun Young Yi’s 2011 ‘Cube’ library. From there we will go by tram to St Georg Church (Hugo Schlösser, 1929-30) and on to the Weissenhof Museum and Estate (1927). Included is a tour of the Museum and a guided walk of the estate. We then walk to the nearby Killesberg Park (1939), the Kochenhof (1933) residential development (a response to the Weissenhof, lead by Paul Schmitthenner) and more recent buildings and landscaping, the Killesberghöhe (2013, David Chipperfield et al). Return to the City by public transport. You are free to make your own arrangements for dinner. Meet 09.30 at the Central Railway Station. We will walk via the Ferdinand Leitner Bridge (Leonhardt/Andrä,1961) to the Stirling/Wilford buildings (1984, 1996), with entrance to the State Gallery main collections included. Late morning, we take the coach to the inventively decorated Liederhalle venue (Abel, Gutbrod, Spreng, 1956) (details still to be confirmed) before heading out of the City to see the Asemwald housing development (Jäger and Müller’s 1960s mega blocks in landscape setting) and finally to the airport. Here you can note gmp Architects’ Frei Otto-inspired internal support structure. We will arrive at the airport by 15.00 pm to connect with the Eurowing flight to Heathrow. Other evening flights are available. Also possible to travel to Stuttgart via Eurostar. Price: £329 for members, £384 for non-members. This includes entrance fees, public transport, coach transport Friday afternoon, group dinner on the Friday, a basic sandwich/snack lunch on Sunday and the coach to the airport on Sunday afternoon. Please arrange your own outward and return flights, transfer from the airport to Stuttgart and accommodation. We will be on foot on Thursday afternoon and all day Saturday. Aside from the itinerary, there is much to see in the city, for example, the Mercedes Benz (2006) and Porsche (2008) museums.